This is an old revision of this page, as edited by InternetArchiveBot (talk | contribs) at 18:19, 21 November 2017 (Rescuing 1 sources and tagging 0 as dead. #IABot (v1.6.1)). The present address (URL) is a permanent link to this revision, which may differ significantly from the current revision. Jan Pieter "Jan Peter" Balkenende, Jr. (Dutch pronunciation: [ˈjɑn ˈpeːtər ˈbɑlkənˌɛndə] ( listen); born 7 May 1956) is a retired Dutch politician of the Christian Democratic Appeal (CDA). He served as Prime Minister of the Netherlands from 22 July 2002 until 14 October 2010. Balkenende, a jurist by occupation, worked for the Dutch Academic Senate and the Christian Democratic Appeal think tank from 1982 until 1998. Balkenende became a professor of Christian theology at the Vrije Universiteit Amsterdam in 1993. He was elected to the House of Representatives after the Dutch general election of 1998, serving from 19 May 1998 until 22 July 2002. After the then Leader of the Christian Democratic Appeal and Parliamentary leader in the House of Representatives Jaap de Hoop Scheffer stepped down after an internal power struggle between him and then party chair Marnix van Rij, Balkenende was selected to succeed him in both positions, and became the Lijsttrekker (top candidate) for the Dutch general election of 2002. The Christian Democratic Appeal became the surprising winner of the election, gaining 14 seats becoming the largest party in the House of Representatives. This success was in part owed to Balkenende's neutral attitude in the debates with Pim Fortuyn, the eponymous leader of the Pim Fortuyn List party who was assassinated during the national election campaign on 6 May 2002. The following cabinet formation resulted in a coalition agreement with the Christian Democratic Appeal, Pim Fortuyn List (LPF) and the People's Party for Freedom and Democracy (VVD) which formed the First Balkenende cabinet with Balkenende becoming Prime Minister of the Netherlands taking office on 22 July 2002. The cabinet Balkenende I collapsed on 16 October after just 87 days in office after internal conflicts within the Pim Fortuyn List that destabilized the government. For the Dutch general election of 2003, Balkenende again as lijsttrekker won one seat and the following cabinet formation resulted in a coalition agreement with the Christian Democratic Appeal, the People's Party for Freedom and Democracy and the Democrats 66 (D66) which formed the Second Balkenende cabinet. On 29 June 2006 the Democrats 66 retracted their support for the cabinet Balkenende II after criticizing the way Minister for Integration and Immigration Rita Verdonk (VVD) had handled the crisis around the naturalization of her party fellow elected to the House of Representatives Ayaan Hirsi Ali. On 7 July 2006 a rump cabinet Third Balkenende cabinet was formed and stayed in office until the Dutch general election of 2006. Balkenende again as lijsttrekker lost three seats but the Christian Democratic Appeal remained by far the largest party with 41 seats. The following 2006–2007 cabinet formation resulted in a coalition agreement with the Christian Democratic Appeal, the Labour Party (PvdA) and the ChristianUnion (CU) that formed the Fourth Balkenende cabinet. On 20 February 2010 the Labour Party retracted their support for the cabinet Balkenende IV after a disagreement over the extension of the ISAF mission in Afghanistan. For the Dutch general election of 2010, Balkenende was appointed again as lijsttrekker, but his party lost 20 seats; he resigned his position as Leader of the Christian Democratic Appeal on 9 June, taking political responsibility for the disappointing results in the election. Balkenende remained Prime Minister of the Netherlands until the First Rutte cabinet was installed on 14 October 2010. After his premiership, Balkenende retired from active politics at the age of fifty-four and became a Partner Corporate Responsibility for Ernst & Young and a professor of Governance, Institutions and Internationalization at the Erasmus University Rotterdam. Jan Pieter Balkenende, Jr. was born on 7 May 1956, in Biezelinge in the Netherlands Province of Zeeland in Reformed family, the son of Jan Pieter Balkenende, Sr. a cereal grains merchant and Thona Johanna Sandee, a teacher. During his childhood, Balkenende was an active supporter of the Dutch football team PSV Eindhoven, along with his father he frequented many matches. He also regularly visited the local music school and theatre. Balkenende went to a Reformed Protestant primary school in Kapelle. He attended secondary school at the "Christian Lyceum for Zeeland" in Goes, graduating in 1974. He studied at the Vrije Universiteit in Amsterdam, where he received a Master of Arts degree in history in 1980, an Master of Laws degree in Law in 1982, and finally a Doctor of Philosophy degree in Law in 1992. Balkenende resides with his wife, Bianca Hoogendijk, and his daughter, Amelie, in Capelle aan den IJssel, a suburb of Rotterdam. During his tenure as Prime Minister, he did not use the Catshuis, the formal residency of the Prime Minister. Jan Peter Balkenende and then Prime Minister of Italy Silvio Berlusconi in 2003. Jan Peter Balkenende and then President of the United States George W. Bush in 2004. Jan Peter Balkenende and President of Russia Vladimir Putin in 2004. Jan Peter Balkenende and then Chancellor of Austria Wolfgang Schüssel in 2006. Jan Peter Balkenende and then President of the United States George W. Bush in 2008. Jan Peter Balkenende and then Prime Minister of Luxembourg Jean-Claude Juncker in 2009. Jan Peter Balkenende and President of the United States Barack Obama and First Lady of the United States Michelle Obama in 2009. Jan Peter Balkenende and then Prime Minister of Belgium Yves Leterme in 2009. Jan Peter Balkenende and Prime Minister of the Netherlands Mark Rutte in 2012. He began his career on the staff of the research institute of the CDA and as a city councilman in Amstelveen. In 1992 he received his PhD with a thesis on "Governance regulation and social organisations" (Overheidsregelgeving en maatschappelijke organisaties), a strongly inspired by the Communitarian ideas of Amitai Etzioni. One year later in 1993, he became an extraordinary professor of Christian-Social Thought at the Free University of Amsterdam. Balkenende first entered the House of Representatives on 19 May 1998 while the CDA was in opposition. He became the CDA's financial spokesman and was also involved with social affairs, justice, and domestic affairs. In this role he advocated a substantial reduction of the national debt and sound public finances. He was elected Chairman of the CDA parliamentary fraction on 1 October 2001, succeeding Jaap de Hoop Scheffer. On 3 November 2001, he was appointed lijsttrekker for the CDA in the tumultuous May 2002 parliamentary elections. These elections restored the CDA's former position as the largest political party in the Dutch parliament. Balkenende has been prime minister of four successive cabinets. On 4 July 2002 Queen Beatrix asked Balkenende to form a new government after the general elections following the resignation of Prime Minister Wim Kok. This cabinet is known as Balkenende I. The coalition cabinet included the Pim Fortuyn List (LPF) party, whose leader (Pim Fortuyn) was assassinated just days before the election. It collapsed after just 87 days in office because of internal conflicts within the LPF that destabilised the government. After early elections in 2003 Balkenende formed his second government with: Christian Democratic Appeal (CDA), the liberal People's Party for Freedom and Democracy (VVD) and the progressive liberal D66. Once again leader of a centre-right coalition, Balkenende's policies centred on reform of the Dutch public services, social security, pre-pension facilities, public health, reducing crime, a tough immigration policy and historically large cuts in public spending. The measures gave rise to large public anger and bad results in opinion polls for his CDA party. While his party remained the largest Dutch delegation in the European Parliament after the European Elections, beating the general expectation of a huge loss in parliamentary seats, the party suffered strong losses during Dutch municipal elections of 2006, losing their position as the largest party in many municipalities. Despite his unpopularity among Dutch voters (polls in 2006 showed that only 26–33% of the voters had confidence in him as prime minister), his position as leader of the CDA remained stable. In the beginning of 2006, some CDA members tried to replace Balkenende as leader with minister Cees Veerman. Veerman did not accept this and offered his support to Balkenende. Balkenende's popularity recovered since then, surpassing that of his main competitor Wouter Bos in the autumn of 2006. By then, 53% preferred Balkenende as Prime Minister while 40% preferred Bos. This switch in public opinion is sometimes explained by the steady recovery of the Dutch economy during the last year of his administration and the positive effects of the reformed policy of the Balkenende cabinet, combined with declining confidence in Bos as a good alternative for the position of prime-minister. On 1 July 2004 Balkenende took up the rotating presidency of the European Union. On 30 June 2006 D66, the smallest coalition party, withdrew its support of the government over the way immigration minister Rita Verdonk had handled the crisis around the naturalization of Dutch MP Ayaan Hirsi Ali. Balkenende resigned for the second time as Prime Minister, announced early elections and presented his third government a week later. This rump cabinet, formed of a minority coalition of CDA and VVD, stayed in office until the elections of 22 November 2006. Though his old coalition partners VVD and D66 fared badly in the parliamentary elections of 2006, Balkenende managed to defend the dominant position of his CDA. Needing alternative coalition partners to form a new majority government, he formed a social-Christian coalition with the Dutch Labour Party (PVDA) and the orthodox-Protestant ChristianUnion. This Fourth Balkenende cabinet is a coalition cabinet of the Netherlands, formed by Balkenende, who was appointed formateur by Queen Beatrix on 9 February 2007. His cabinet was announced on 13 February and was scheduled to be in office until 2011, but it fell in the early morning of 20 February 2010 as the result of disagreement between the majority of the parliament and the coalition partners CDA and PvdA over the extension of the Dutch ISAF-mission in Afghanistan. In contrast to the formation of a new caretaker cabinet with full responsibility (Balkenende III after the fall of Balkenende II), Balkenende IV continued as a demissionary cabinet, a caretaker cabinet with limited responsibility. Despite serious criticism by former prime ministers from the CDA, Balkenende was the Christian Democratic Appeal Lijsttrekker for the Dutch general election of 2010. Balkenende raised mild controversy during his campaign for the 2010 Dutch elections. While appearing in a television show, Balkenende was asked by a female presenter what parties he would most likely form a coalition with. Balkenende first gave evasive answers, then when asked again by the presenter, responded saying "U kijkt zo lief" (English: "You look so cute"). The comment was regarded as sexist and criticized by several people, including Opzij chief-editor Margriet van der Linden and GroenLinks leader Femke Halsema (who stated that "[the prime minister] deserves a knee to the groin" (in Dutch: "een knietje verdient")). Balkenende apologized for the comment later. On 9 June 2010, Balkenende resigned his position as leader of the CDA as well as his seat in the newly elected parliament, taking political responsibility for the CDA's disappointing election results in the 2010 general election. In 2004, during his second cabinet, Balkenende was diagnosed with necrotizing fasciitis. He was treated through surgical debridement and made a full recovery after several weeks in hospital. On 4 June 2005, the Belgian Minister of Foreign Affairs Karel De Gucht said in the Flemish newspaper Het Laatste Nieuws (The Latest News) that "Balkenende is a mix of Harry Potter and a petty rigid bourgeois mentality". This comparison caused a small diplomatic controversy, and the Belgian ambassador had to apologise to Ben Bot, the Dutch Minister of Foreign Affairs. Retired deputy prime minister Hans Wiegel commented he preferred Harry Potter to the Manneken Pis. Balkenende has a close relationship with the Dutch people from Suriname and the Netherlands Antilles. He has visited several Keti Koti celebrations in recent years. He was a member of the Reformed Churches in the Netherlands and since 1 May 2004 a member of the Protestant Church in the Netherlands. ^ a b "Mr. Dr. J.P. Balkenende" (in Dutch). Leiden University. Retrieved 2007-06-07. ^ "The Political Center under Pressure: Elections in the Netherlands" (PDF). ^ "Balkenende als premier populairder dan Bos" (in Dutch). Elsevier. 10 September 2006. Archived from the original on 10 February 2008. ^ "Balkenende benoemd tot formateur" (in Dutch). NOS.nl. 9 February 2007. Archived from the original on 11 February 2007. ^ Tyler, John (20 February 2010). "Dutch government falls over Afghanistan mission". Radio Netherlands Worldwide. Retrieved 20 February 2010. ^ "Balkenende excuseert zich voor 'u kijkt zo lief'" (in Dutch). Nederlands Dagblad. 27 May 2010. ^ "Wat zeg je terug op "U kijkt zo lief"?" (in Dutch). NRC Next. 27 May 2010. ^ De Telegraaf. "Balkenende weg als CDA-leider". Retrieved 2010-06-09. ^ "Belgian Potter jibe upsets Dutch". BBC News. 6 June 2005. 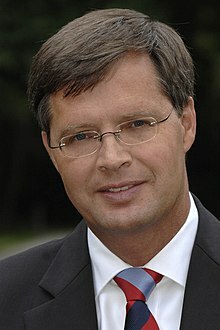 Wikimedia Commons has media related to Jan Peter Balkenende.